In my last post I shared an example of the false infrared colour technique and explained how it was achieved. I also confessed that in general I don’t like the effect, although in some cases it does work well. I thought it would be good to share another example that I think works reasonably well (although not as well as the previous post) although I will admit that I still prefer the traditional black and white conversion. This example is a little more stylised than the previous image and was created by first converting the image to colour before applying a Fuji Provia Slide Film simulation in Exposure 6. This was then further edited with a boost to the Vibrancy slider and a negative Clarity to give the soft effect. My reasoning for these adjustments was to prepare the image for conversion to black and white but I found I quite liked the colour image. When converting the images with the Channel Mixer it can seem a bit hit and miss. It appears to help if you have both sky and foliage in the image. With a Red/Blue channel swap such as shown here the sky will turn blue and the foliage will go red. Most other areas (in landscapes) tend not to be affected. You can improve the results by picking a white balance point during RAW conversion which causes the foliage to take on a blue tint. Typically this will leave the sky with some red tint and when the channel swap is made with the channel mixer the red tint in the sky turns blue and the blue tint of the foliage turns red. Also try to avoid images which have been shot in the shade (such as tree lined country lanes) as you won’t get such a good effect. You really need direct and strong sun to make this work well. Hope this helps anyone who is also struggling with Infrared false colour. As inspirational as ever Robin. Like it or not – they are all excellent examples of the kind of images that can be obtained using that technique. I still can’t decide what I prefer: 590 false colour, 665 false colour or either Silver Efex Pro adjusted for high contrast black and white with fine serial tone control. But it’s the best fun I have in photography. It’s now beginning to take over from my ‘normal’ photography. Your work, and that of other big names in the field, is a priceless minefield of inspiration. Keep up the great work and I hope things are going as well as they can be in your world. Thanks Roger. You kind words are much appreciated. Something that you might like to try (and which I used for the previous image) is start with an image that is suffering from being too red as it was produced in Lightroom or Camera RAW. Do a red blue channel swap and then colour correct it. To do the colour correction use the curves dialog in photoshop. Take each channel in turn and move the black and white point of the curve to meet the start and end of the historgram. This can produce some very nice colours that are a little different to the usual. I’ll certainly give that a try Robin. Funnily enough, Mark Hilliard (USA) recommends something similar in one of his tutorials. 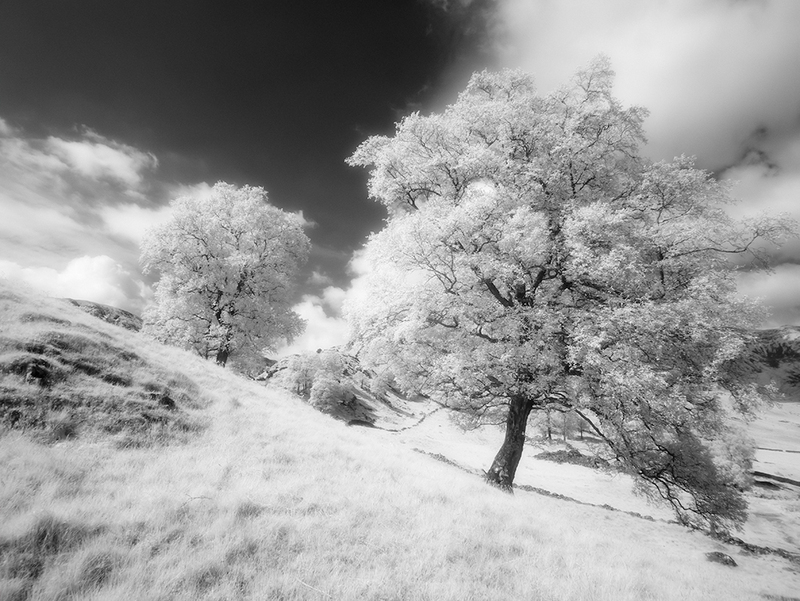 I haven’t really fully explored the full potential of IR RAW yet because of the limitations of Camera RAW and Lightroom. I hear though that Capture One has more latitude so may give that a try in due course. Sadly, my ‘new’ 590 converted X-E1 has had to go back to have a faulty EVF ribbon connector sorted. So I’m temporarily back to ‘muggle’ photography! Thanks. I must check out Mark Hillard – I wasn’t aware of anyone else experimenting in this way. I have to admit that I was also using Capture One until recently but I found the image quality isn’t as good as I can now achieve with Lightroom. I created a new Camera Colour profile with the Adobe DNG editor to correctly white balance the images and the quality seems to have improved. I will write about that at some point. Sorry to hear about your X-E1. Hope you get back to the surreal world of infrared soon.